The Mérida Institute of Archaeology (IAM) is a research centre belonging to the Spanish National Research Council (CSIC). 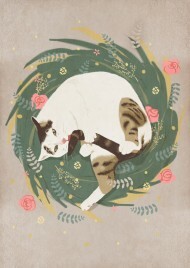 “Today is gonna be a great day” print. Look at those cute faces, two clouds and the sun will wish you a great day. This is the story of two friends, each one from one side of the river. Two bears, two clouds and five mountains are the landscape of their friendship. 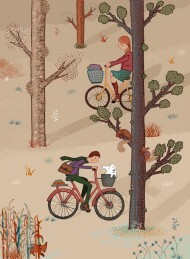 Berlin is a city of woods, bicycles, squirrels and a little fox, that is what I discovered in my last stay in the city. A Ionian cup is at the origin of this illustration. A yellow heron rests on the leaves full of fruits. 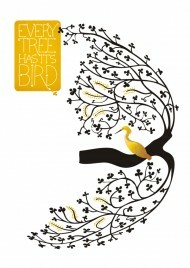 Every tree has its bird. 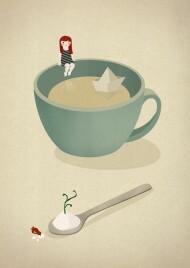 A little girl sitting on a “cup beach” looks a paper boat while a red little bird eats some sugar. Dreaming about traveling somewhere? 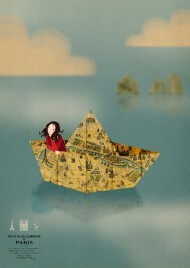 A young woman fleeing away on an origami paper boat. The development for the brand for the CMR -Circolo Medievistico Romano- takes origin on the miniatures of the manuscript by Giovanni Boccaccio “De Casibus Virorum Illustrium”. 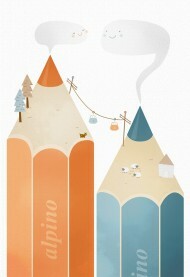 I could live on a pencil mountain.